The law regulating what information a person must reveal concerning his or her criminal record when seeking employment attempts to strike a balance between guarding against the risk of harm caused if someone were to reoffend and allowing someone to get their life back on track by giving them an opportunity for rehabilitation. There is a clear public interest in those who work with children or vulnerable adults being required to submit to criminal record checks. However, the current system has come in for criticism, for example in Charlie Taylor’s December 2016 ‘Review of the Youth Justice System in England and Wales’ and by the Law Society in 2017, prompting the question – how old or minor do convictions have to be in order to be exempt from disclosure? In R on the Application of P, G and W (AP) v Secretary of State for the Home Department and Another, the Supreme Court addressed this issue. The case concerned four individuals seeking to challenge the current criminal records disclosure rules as being incompatible with Article 8 of the European Convention on Human Rights (ECHR), which protects a person’s right to respect for private and family life. All four had been convicted or received cautions or reprimands in respect of relatively minor offences, and the relevant convictions and cautions were all ‘spent’. In each case, however, the criminal records had to be disclosed if the individuals wished to work with children or vulnerable adults. The convictions of two of those seeking a change in the law were not filtered because they had committed more than one minor offence. One of them had been cautioned for shoplifting twenty years ago after she stole a sandwich, then convicted of a bail offence in the same year after she failed to attend court when prosecuted for stealing a book priced at 99p. She was homeless at the time and suffering from mental illness. Because of the multiple offences rule, she was unable to get a job as a teaching assistant. The others seeking a change in the rules had committed offences when they were very young. In one case, a 13-year old boy had been reprimanded for a sexual assault on two younger boys. The police record indicated that the activity was consensual and came about as a result of sexual curiosity and experimentation by all three as a result of ‘dares’. He has not offended since but lost his job as a library assistant when he failed to apply for an enhanced criminal record check as he feared disclosure. The Supreme Court conducted a comprehensive review of the relevant law and ruled, in a majority decision, that the criminal records disclosure schemes, which are derived from the Rehabilitation of Offenders Act 1974 and the Police Act 1997 – both of which create highly prescriptive and mandatory disclosure regimes – pass the legality test. On the issue of proportionality, the schemes are not indiscriminate in nature and have been carefully devised to ‘balance the competing public interests in rehabilitation, safeguarding and practicability’. There is a need to have in place a practicable and proportionate scheme and so legislation by reference to pre-defined categories is justified as the final decision about the relevance of a conviction should be down to the employer, who is best placed to assess the individual circumstances. For that reason, ‘bright-line rules’ are necessary and preclude a system of individual assessment. In the Court’s view, the carefully drawn categories in the legislation are not disproportionate, with two exceptions which are in breach of Article 8 of the ECHR. The first is the multiple convictions rule, which does not achieve its purpose of indicating a propensity to offend and applies irrespective of the nature, similarity, number or time intervals of offences. The second concerns warnings and reprimands given to younger offenders. 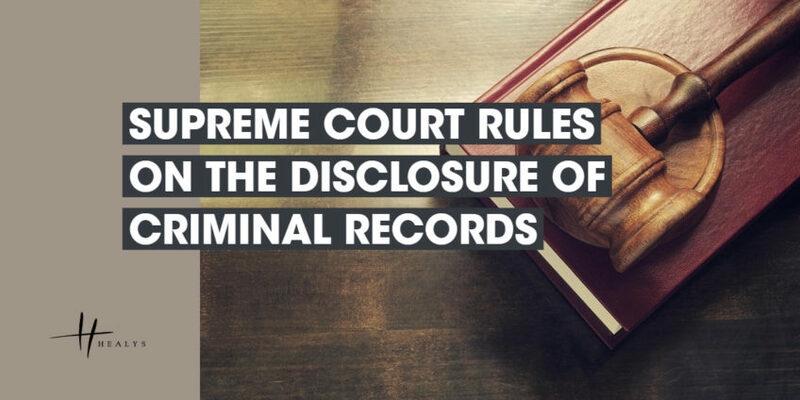 The schemes fail to take sufficient account of the fact that such warnings and reprimands are meant to be instructive and specifically designed to avoid damaging effects later in life through disclosure. The Court found in favour of those challenging the law in three of the four cases but agreed with the Court of Appeal that it was appropriate to include assault occasioning actual bodily harm within the category of offences requiring disclosure. Whether the government’s response will be to make only the necessary changes to the disclosure rules or to carry out a wholesale review of this area of law remains to be seen.